When I explained how the Leap Motion device could be used on Fedora 19, I mentioned how I had one of those early prototypes. Well, Leap Motion was extremely kind and sent me an actual device as a thank you for starting the thread asking for Linux support. Now that GUADEC is over and I am spending my vacation in Portugal, I had a little time to play with my fancy new device and wrote a relatively small script to control GNOME with it. I call it the über original name of: Leap GNOME Controller! The two videos that compose the one above were recorded with an HD camera and GNOME Shell’s screencast recorder. I tried to sync them the best I could but a certain delay can be noticed, especially at the end of the video. Leap Motion provides a “close source” shared library and a high-level API with the respective documentation for the many bindings it has. To code it quickly, I used the Python bindings and Xlib to fake the input events. Leap Motion’s APIs make it really easy for one to simulate a touch-screen. It even offers a “screen tap” gesture that should be the obvious choice when mapping a finger touch/tap to a mouse click. However, this didn’t work very well. The problem is that if we are tracking one finger to control the mouse movement, when performing the “screen tap” gesture, the finger (and mouse) will of course move. Making it as frustrating as seen on ArsTechnica hands-on video. I came up with a solution for this by dropping the “screen tap” gesture and using the “key tap” instead. The “key tap” is a simple, quick down-and-up finger movement, like pressing a key. This is much more precise and easier for a user to do than the “screen tap”. Of course that when the finger moves for performing the gesture, the mouse pointer would move as well, so I came up with a little trick to work around this: when the mouse pointer doesn’t move more than a couple of pixels for half a second, it will stop and only move again if the user makes it move for more than 150 pixels. This allows for the user to stop the pointer with precision where it needs to be and perform the gesture without making the pointer move. The Leap device offers a lot of possibilities for adding many gestures. Ideally they should be implemented per application but being able to control the shell is already pretty useful, so it would be wonderful to fine-tune the current gestures and add new ones. I also wish the library’s source code were open because I ran into small issues and I wish I could take a look at the source code, instead of trying to fix it based on the theories of what might be wrong. I haven’t explored the AirSpace appstore yet so I don’t know if it is worth adding (or possible to add) this script there but I will check it out. Have fun with Leap and GNOME! The first release of Skeltrack in 2013 is out! This is also the first version I release without being associated with Igalia but the company agreed that I keep maintaining the project. That’s one of the good aspects of working in Free Software as your daily job: you can continue working on them even if you’re no longer in the company where it was first developed. This new version is not bloated with new features so “why such a wait?” you might ask. Well, the reason is that there have been a few changes in my life since last year and, more importantly, after I left Igalia, I didn’t have a Kinect and thus, working on Skeltrack was a bit difficult… But finally a few weeks ago I bought one so now I am able to keep hacking. Luckily, Iago López (kudos to him) did a neat work in fixing some misuses of GList but more importantly, re-implementing Dijkstra using a priority queue. If you remember your algorithms courses well, with this change you can make Dijkstra go from quadratic to linearithmic time and that’s a BIG improvement. 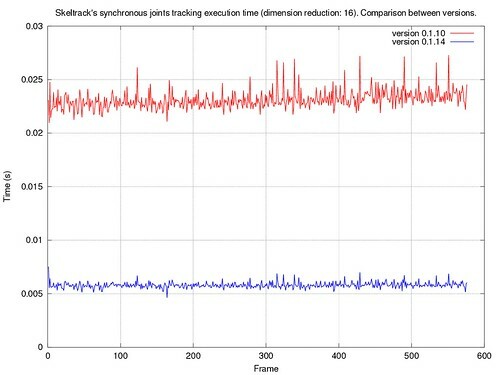 The values used to generate the plot were the time it took skeltrack_skeleton_track_joints_sync to execute. For each of the versions, this function was called 25 times for each of the 550 depth frames and the final values in the plot are the arithmetic average of the results per frame. They were executed in my i5 2.40 GHz laptop without any applications or the desktop running (besides system’s services). Besides some small bug fixing in the library, the Skeltrack Kinect example was ported to Clutter 1.12 to keep up with the work done upstream. The page is a bit ugly and minimalist but we’ll improve it. The documentation can now be found here and bugs can be filed in GitHub as usual.